AIChE is in Phase III of developing the Institute’s new strategic plan. In March and April of 2018, AIChE gathered and analyzed data and input from current members, potential members, and other stakeholders through surveys, virtual focus groups, and in-person meetings. 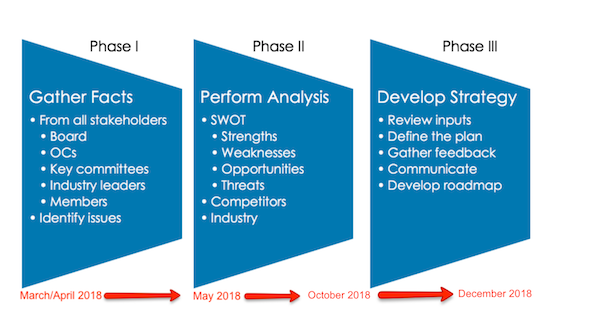 Subsequently, in May, this data was analyzed to assess strengths, weaknesses, opportunities, and threats to AIChE’s role in the chemical engineering community. The plan was written in June and a draft was presented to AIChE’s Board of Directors in July. After the Board’s feedback, the plan was revised in August, finalized during September, and officially approved on October 2, 2018. During the 2018 Annual Meeting in Pittsburgh, the strategic objectives were presented in separate meetings to the Operating Councils, AIChE Membership (at the Business Meeting), the Public Affairs and Information Committee, the Fellows, the Foundation, and were highlighted for all attendees at the AIChE booth. In November, to expand the visibility of the plan, these objectives will be shared with members on social media and in December’s CEP magazine. Led by staff in collaboration with the Operating Councils and relevant committees, the roadmap for the plan will be worked on during November and December 2018. I look forward to keeping you updated as we move forward in this process.